Please arrive 15 minutes prior to start of practice so we can start on time. Contact me if there are any questions. See you at the track. Today’s TISC practice & program is cancelled due to rain & wet track conditions. Hopefully see you Monday in good weather. Learn to Skate semi private lessons and Youth open track time are at 6pm and you must contact us to take part in lessons at $30 per person. Regular racing and fitness program warm up is at 6:50pm. The track is wet and snowy, so tonight’s skating and program is cancelled. Some skaters will opt to meet at 6pm at Max Ward for a road skate. Click here for details and information plus location for skating at Max Ward. The 200-meter track at Christ the King/ Holy Trinity (Brown’s Line and Lake Shore next to the No Fills & Shopper’s Drug Mart) is covered with puddles. Tonight’s practice at that location is cancelled. Some skaters will gather for a road skate at the famed Max Ward loop near Eglinton and Dixie. Skaters are invited to meet at 6pm at Max Ward Park located at 2380 Matheson Blvd E, Mississauga, ON L4W 5G9. The route is about 4km long, stretching West along Matheson and then a right turn to proceed East along Explorer Drive back to Matheson. There is a marked bike lane along Explorer Drive but Matheson Blvd. features two lanes of live traffic with low traffic volume. Skaters concerned with skating in live traffic lanes can do a u-turn to remain on Explorer or can skate on the side-walk along Matheson. If you are running late, you’ll easily be able to find skaters rolling along this loop. We anticipate a roll out at about 6:15pm after everyone has had the chance to greet each other, change into their gear, and lace up their skates. All skaters are expected to respect the rules of the road and are encourage to use lights to increase visibility. Whether skating on the road or sidewalks, please keep safety as a top priority by watching for fissures and cracks in the road, paying attention to vehicles exiting driveways, and regularly looking back to observe traffic. 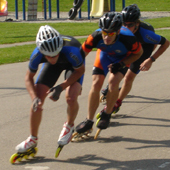 Use of helmet and wrist/ palm protection is mandatory for all who skate in the group, and all are expected to be registered with the Toronto Inline Skating Club. You can now register for 2018 season. In order to be allowed to skate, you must complete the form, waiver, registration with Roller Sports Canada, and payment.